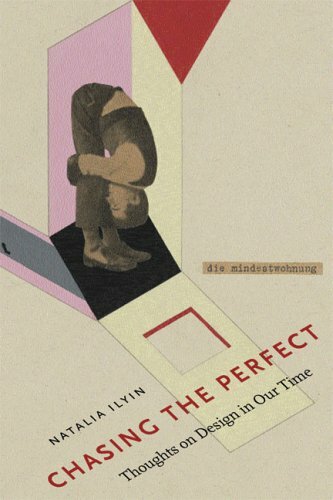 In Chasing the Perfect, writer/designer Natalia Ilyin delivers her astute, incisive, and humorous observations on design and the world it has molded. According to Ilyin, "Modern design is based on deeply idealist notions, and its inherent perfectionism has dovetailed beautifully with our commodity-based economy's need to keep people itching so that they will buy things and keep the society chugging along. I began Chasing the Perfect because I started to become aware of this collusion, this silent pressure that a language of design based in perfectionism had brought to bear on how I developed as a person." Chasing the Perfect is especially relevant in our times as interest in graphic, industrial, and architectural design moves more and more into mainstream culture. Each of the 10 chapters features Ilyin's accessible and often hilarious writing, which is highlighted with a broad range of images—some quite unexpected—from the designed world around us. "Ilyin’s design commentaries will pique the interest of anyone who is serious about design ideology and theology. " -- Steven Heller, Eye Magazine, Spring, 2006"
This book is not what you think. Yes, graphic designer Natalia Ilyin is erudite and keenly insightful. Yes, she waxes eloquently about the state of design in the twenty-first century (and she goes back a bit too). But she is also vulnerable, which is really why this autobiographical book is so worth reading. The book is her story, not a lecture. She trips and falls but realizes amazing things about the world of design in the process, and she confides with honesty and humor what it is she now knows. Written designer to designer, Ilyin understands what touches our hearts and our minds. Chasing the Perfect is about our failure to embrace our whole selves. It's about obsessing on unattainable purity, while denying the value--and reality--of the messiness of life. Ilyin seamlessly weaves often ironic and hilarious tales into powerful metaphors. Her highly creative identical twin Russian aunts have identical fingerprints but are polar opposite personalities; one is a modernist, the other is an eclectic, yet together they make a whole. We see them in ourselves. Ilyin, an ex-New Yorker who now lives on an island near Seattle, drives her beat-up ancient van (shaggy dog in tow) to Redmond, Washington to give a lecture on The Home to engineers at "a huge software company" (guess which one) and sees the irony of being chosen to talk on a subject she has yet to fully consider. While touring their soulless Home of the Future (where everything is automated), she channels Ernest Becker: "The great tragedy of our lives is that the major question of our existence is never put by us--it is put by personal and social impulsions for us..." An epiphany for Ilyin on what makes a home--design-wise. I will not say more because I would not want to spoil this for you. If you are a thinking designer, and an empathetic person, you must read this book. That's all there is to it. This book is a first for me: a humorous book about design. In fact let's say that again: a humorous book about design. A very rare commodity indeed. I enjoyed this book so much I read it in one sitting (it's also not a large book at 128 pages) and it's a thoroughly delightful read. Ilyin has a graceful and terribly witty way of writing. Chasing the Perfect is a personal reflection on Modernism's influence on the teaching of design and its practice....Chasing the Perfect is really a tragi-comedy. But as any comic knows,much comedy is rooted in personal tragedy - so stand by for the occasional hearty laugh, quite a few chuckles and a constant 'smile on the mind' whilst reading Ilyin's graceful ode... The book is also much more than merely a 'funny read' - it's quite a solid critique of Modernist principles and their influence on Western culture. Just try to stop smiling when you read Chasing the Perfect - I couldn't. (Especially the bit about the glowing Modernist box house).